Unbeknownst to many, Americans are quietly ditching the city life for retirement regions situated in suburbia, according to Census Bureau data released Thursday. 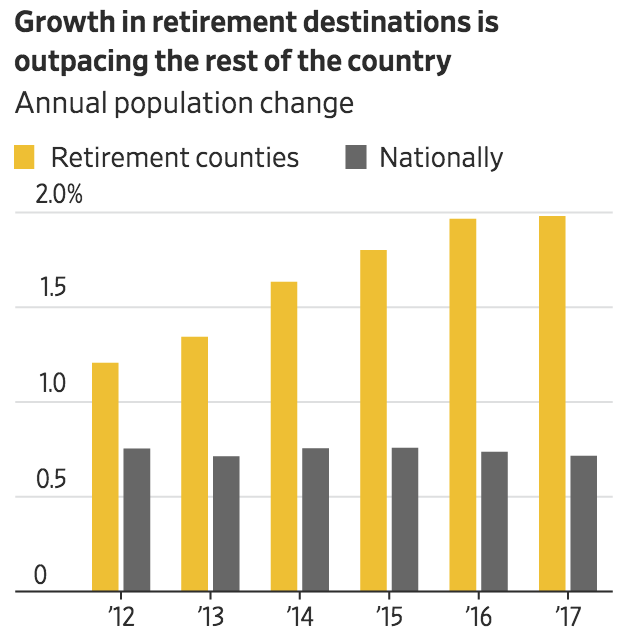 The Wall Street Journal describes this phenomenon as an exodus of baby boomers “fueling growth in retirement hot spots” outside of large cities. 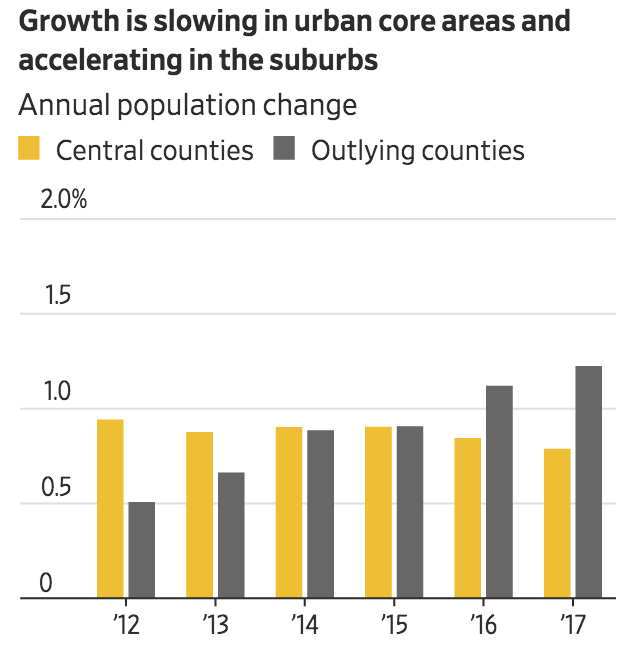 WSJ even spills the beans on the unhealthy state of the millennials, who specifies a majority of them have been “priced out of expensive urban cores,” and in return are starting an alarming trend of generational-flight out of large cities and into to suburbia. Back in December, we explained how the urban revival of America’s core inner cities had been a decades-long failed experiment, as de-industrialization coupled with failed liberal policies have created a growing problem of inequality and violent crime. Perhaps, the knowledge of a mass exodus of America’s most influential generations [baby boomers & millennials] fleeing large cities for suburbia is a troubling reminder that at the core of America’s economy — something is amiss. According to The Wall Street Journal, newly released figures from the Census Bureau suggests that population growth shifted last year towards suburbia and less congested places favored by baby boomers. In other words, retirees are fleeing large cities and are moving to the countryside. The population of federally designated retirement destination counties rose 2% last year, almost three times the rate of national population growth, according to census county population estimates for the year that ended July 01. Almost three-quarters of a million Americans during that period moved into one of the 442 counties that the Agriculture Department tags as retiree spots. The figures are a fresh sign that the nation’s 74 million baby boomers—those born between 1946 to 1964—have dug out from the 2007-09 recession that locked many of them in place when home and stock values plummeted. The Wall Street Journal identifies a handful of retirement regions across the country — primarily based outside of large cities that are experiencing tremendous population growth. In particular, the American business-focused newspaper says retirees from Baltimore City are fleeing north to Gettysburg, Pennsylvania, to escape high property tax. They have fueled double-digit population growth in some old staples for retirees, such as Naples, Fla., and other places far from the Sunbelt, including Jackson, Wyo., and Coeur d’Alene, Idaho. Coeur d’Alene shot up to become the country’s fifth fastest-growing metropolitan area. Picturesque lakeside views and walking trails are drawing older transplants from higher-cost states like California and Arizona, said Hilary Anderson, the city’s community planning director. New developments are geared toward those age 55 and older with single-story home layouts, low-maintenance yards and snow-removal service. In Weld County, Co., which runs northeast from the Denver suburbs, local officials are touting low property taxes and proximity to Rocky Mountain National Park. Also outside the Sunbelt, the Adams County, Pa., area that contains Gettysburg is pulling in retirees from Baltimore. While The Wall Street Journal describes the millennials as a “juggernaut of 71 million Americans born between 1981 and 1996,” it appears this avocado and toast generation is nearing its peak in attempting to revive the American inner city and has now started to relocate to suburbia. The suburban population of large metropolitan areas grew 1% last year. Domestic migration into such counties has tripled over the past five years, reaching 265,000 last year, census figures show. America’s big cities continue to grow, with their population rising 0.7% in 2017. But that growth is now on par with the country on the whole after years of outpacing it, and is primarily because immigrants keep arriving there. In the past five years, large U.S. cities have gone from drawing people from the rest of the country to in 2017 losing 437,000 domestic migrants as residents flow to suburbs or uproot for midsize cities. The millennial generation—a juggernaut of 71 million Americans born between 1981 and 1996—helped revive cities by moving there for jobs and delaying marriage and children longer than previous generations. While birthrates among millennial women remain low, there are signs that some who put off having children after the recession are now going forward with it. Among women ages 30 to 34, the birthrate in 2016 rose to its highest level since 1964, according to the most recent Centers for Disease Control and Prevention figures released in January. This age group had children at a higher rate than women ages 25 to 29 for the first time since the government began tracking the figures reliably in 1940. John Burns, chief executive of John Burns Real Estate Consulting in Irvine, California, which advises residential home builders, says clients are concentrating more and more on luring millennials out of large cities with “surban” developments that have walkable amenities. 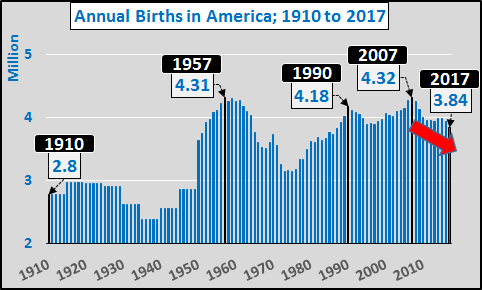 As the baby boomers and millennials start a menacing metamorphosis in changing the landscape of America’s large cities, Chris Hamilton via the Econimica blog paints a grim outlook, as the declining annual births show trouble is ahead. Is the American empire headed in reverse?